This year’s Willow Bowl club ace took part last Saturday around the Greenock Cut. It was a cracking day for it, with bright sunshine spoiled only by a strong southerly wind. The annual loop around the cut saw the runners face a cutting head wind as they made their way up the hill from the Waterman’s Cottage and down into Cornalees. Once onto the cut itself, the runners were able to use to tailwind to get them home. As a conceding handicap race, the runners were set out in a staggered start, with the aim of seeing them all hurtling towards the finish line at the same time. However, there was a clear winner in the form of Kevin Gill. The popular taxi driver come ultra runner lead from near the front and was never in any danger of being caught as he swept the handicap race. His celebrations in the race sponsored Willow Bar went on into the small hours. Well done Kev! The first vet runner across the line gets to take home the Tommy Knight trophy, and this year it went to new member and keen triathlete Helen Ridley who was second only to Kevin in the handicap race. Helen becomes the second recipient of the trophy dedicated to the late Tommy Knight and presented by his family in his memory. Elsewhere in the handicap race, there was a tremendous battle between two Roberts, as President Dolan battled it our with Robert Wilson Jnr who was making his return to club racing after a two year absence. Setting off together, it was only in the last mile that Dolan got clear in a huge PB for him for this race. This also sees him jump up to the top of the handicap championship standings alongside John Stevenson who also had a cracking race. Among the ladies performing well in the handicap race was Debbie McKenzie securing her first top 10 as a harrier. There were many individual battles along the cut as runners fought tooth and nail to get as good a finish as possible. Cheryl Thomas fought her way, quite literally, to a good finish. David McCorkindale, Frank McMahon and Robin McAuslan also had great runs to nestle inside the top 10 in the handicap race. The men’s race was made very interesting with Andrew White taking advantage of the good early morning conditions to test himself at Greenock parkrun. His 5k time of 16.32 was just outside of his pb as he continues his excellent recent form. The question would be if his legs could hold up for the afternoon race? Well we should never really doubt Andy’s strength as he ran out a clear winner in just 46.35, almost a minute clear of Paul Monaghan in second place. Paul’s run of 47.30 was also a great time for the course and shows that his high mileage is paying dividends. Robert Dolan’s fine run of 50.15 was good enough for third place, with Robert Wilson Jnr just behind in fourth spot. John Stevenson was in fifth place and just 7 seconds separated 3rd to 5th! Andy McCall was able to nab 6th sot narrowly from Steven Campbell and there was also some pb runs in the chasing pack with Stephen Hanley among them. Elsewhere it was great to see young Callum Gorry complete the race in a fine time of just over 62 minutes, with this being the farthest he has raced so far. He is one of seven members now to have ran every race this year! How many of them can keep it going for all 11? Next race is the longest in the calendar, the 10 mile Docherty Cup on April 13th. We’d like to thank the army of volunteers who were out helping the runner get round the course safely last week. there were so many photographers out taking advantage of the scenic views and it was hard to whittle them down for this article! A massive thank you to each of them and to our race sponsors The Willow Bar. 42 runners were in attendance, a trend that sees our club races growing in popularity this year. Lets keep it going! This entry was posted in Uncategorized on February 24, 2019 by greenockglenparkharriers. Erin McEleny and Douglas Campbell were joint winners of the GGH Tower Hill cross country League after recording the quickest times in the final time trial on a windswept Tower Hill. After 4 long months of competition the pair couldn’t be separated with both gaining maximum points, attending all 9 rounds and running quickest in their category in the 3 time trials. In the final round despite the weather it was a record attendance with 31 youngsters taking part smashing the previous best of 24. The under 11s raced 1 mile, u13s & 15s 2mile, and u17s 3miles around multiple laps of the 800m course. The u13 girls was the closest contest, with Sophie McGinty and Ava Beaton taking advantage of Katie Johnson’s absence to leap frog her to share the girls’ title. Douglas’ brother Ben took the u13 boys title. In the U15s Harris Morrison won from Shaun Wiseman by 1 point, while ever present Abbie Tosh was the victorious girl. Ewan Ferguson and Mhairi Moore came out top in the U17s age group. The most improved athlete was Summer Taggart whose time of 7.26minutes for the hilly 1 mile xc route was 1minute and 40 seconds quicker than she ran in the first time trial. This entry was posted in Uncategorized on February 17, 2019 by greenockglenparkharriers. Harriers trio of Harris Morrison, Jude Dolan and Ben Cameron secured excellent performances at the National Indoor Age Group Championships held in the Emirates Indoor Arena. Harris and Jude contesting the under 15 boys 800m both made huge improvements over the four lap event. Harris running for the first time in this age group was up to cruising speed and held a steady pace over the first 400m. Harris increased his speed approaching the last 200m to move into a qualifying spot to make the final in a new lifetime best. In his final the pace from his competitors was a step up from the heat, however Harris stuck to his own race plan over the first half of the race, which proved fruitful as he began to pull in his competitors to finish a creditable 6th in a time under his previous best prior to this competition. In the other 800m heat Jude was focused from the gun and after a few laps was clearly ahead of previous best times, benefiting from his endurance strength Jude pushed himself into the final 200m and ran clear to cross the line improving his lifetime best by an incredible 10 seconds. Ben participating over the longer 1,500m Final, in his first taste of indoor competition relied on his cross country endurance to tackle the new challenge of the seven and a half laps indoor. With a gutsy performance Ben created a new best to now work towards lowering his time below the 5 minute barrier. This entry was posted in Uncategorized on February 8, 2019 by greenockglenparkharriers. The 2019 Renfrewshire road race took place last Sunday in Greenock. The annual 5 mile race continues to be every popular with the harriers with our senior runners once again turning out in superb numbers. Over 50 of our runner took to the streets on a bitterly cold Sunday afternoon and there were some great results in among them. The 5 mile course takes runners on a lap of the battery park before heading out to the far end of the esplanade. They turn there and make their way back to the start, including another lap of the park to finish. It’s a flat course that often leads to very good five mile times, a race distance not often ran with strong fields. The weather looked horrendous as the senior huddled together inside the pavilion, not really wanting to venture outside. The gods were kind though and the rain eased off, and the wind did likewise. There was still a headwind on the second half of the race, but not as bad as the hour beforehand. Stephen Trainer was unable to return to try and defend his gold medal from last year, as Inverclyde AC’s Sean Fontana took the win in just under 25 mins. Among the chasing pack were Glenpark’s form men in Chris Mooney and Andrew White. Andrew secured the V50 gold medal (and was also first V40!) in under 27 mins, just 10 seconds behind rival Mooney. Paul Monaghan was not far behind as 3rd harrier and newcomer Wes Pattison impressing in his first outing in the sky blue vest. These four as well as Stevie Campbell and Neil Lafferty made up the top 6 counters that claimed the district silver medal in the team prizes, just 2 points ahead of Bellahouston Harriers! Well done guys. The medals didn’t stop there for the men. Graham McGrattan secured the v60 gold with a solid run. Eddie Devine was first v70 and it was great to see Eddie out there smling his way round 5 miles! Among the other men competing, there were some big 5 miles PBs, Robert Dolan, Stephen Hanley and Oliver Reilly standing out. There was also a Harriers debut for Owen Atkinson and Rhys Jones. There was a superb turnout from the Harriers ladies with captain Marian Monk rallying the troops down to the Battery. Sadly the reigning ladies champion had to cheer on from the sidelines due to injury. Sue Hewitson was first Harrier home as she chased down Chloe Simpson (running for Kilbarchan on the day), and Chloe just edged it on the line. Sandra Campbell, Claire Monaghan and Cheryl Thomas all had great runs to make the top 4, but it wasn’t quite enough to sneak into the medals in the team race. It was a day of near misses from the ladies in the medal stakes, as Sue’s run just missed on on v40 bronze. There were a number of debuts from the lady Harriers, with Sandra Devine, Heather Lafferty, Elaine Medinelli and Angela Nelson pulling on the vest for the first time. All have been regulars at Greenock parkrun and more recently at the Harriers sessions, and are loving life in the club! 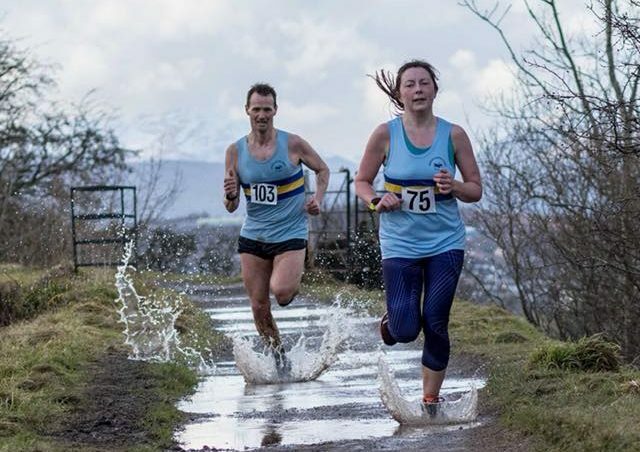 This thirst for running can be continued next Saturday, with the 2019 Willow Bowl up at the Greenock Cut! A conceding handicap race taking in a full loop of the cut is arguably the best club race of the year, it’s certainly the most scenic! It all kicks off at 2pm at the Watermans Cottage Saturday 16th February, with registration in the clubhouse and refreshments in The Willow Bar after! See you there!